Born in New Hampshire in 1838, Franklin M. Holt was a son of Cambridge, Massachusetts native, Edwin Holt (1807-1893) and Mont Vernon, New Hampshire native, Susan (Marden) Holt (1815-1892). His New Hampshire-born siblings were: Martha Holt (1843-1846; died of scarlet fever) and George Holt (1848-1894). In the mid-1800s (per 1850 and 1860 federal census records), the Holt family resided in Amherst, Hillsborough County, New Hampshire, where Frank’s father, Edwin, supported the family as a farmer. Frank M. Holt, who was also described as a farmer in Amherst prior to the Civil War by Lewis Schmidt in his A Civil War History of the Regiment of Pennsylvania Veteran Volunteers, was listed on the July 1860 federal census as a “Pedlar” – possibly indicating that he had been engaged in selling goods produced on the Holt’s farm. Also around this same time, however, Frank Holt was shown on a New Jersey federal census record as a “Map Agent” who lived at a hotel in Keyport, Holmdell Township, Monmouth, New Jersey. By the Spring of 1861, records confirm that Frank M. Holt had relocated again – this time to the community of New Bloomfield in Perry County, Pennsylvania. During the Summer of 1861, at the age of 23, Frank M. Holt enlisted in Company D of the newly formed 47th Regiment, Pennsylvania Volunteer Infantry. Company D was commanded by Captain Henry D. Woodruff. Note: Holt’s obituary indicates that he had also performed his Three Months’ Service as a Private under Capt. Woodruff. That earlier term, completed by so many of the 47th Pennsylvania Volunteers in response to President Lincoln’s call for help after the fall of Fort Sumter, was served by Holt with Woodruff’s Company D of the 2nd Pennsylvania Infantry from 20 April 1861 to 26 July 1861. He had enrolled and mustered in at the age of 22 at Camp Curtin in Harrisburg, Dauphin County. Military records at the time described him as being a resident of Wilford, New Hampshire. On 20 August 1861, Frank M. Holt re-enrolled for a three-year term of service at Bloomfield in Perry County, Pennsylvania. 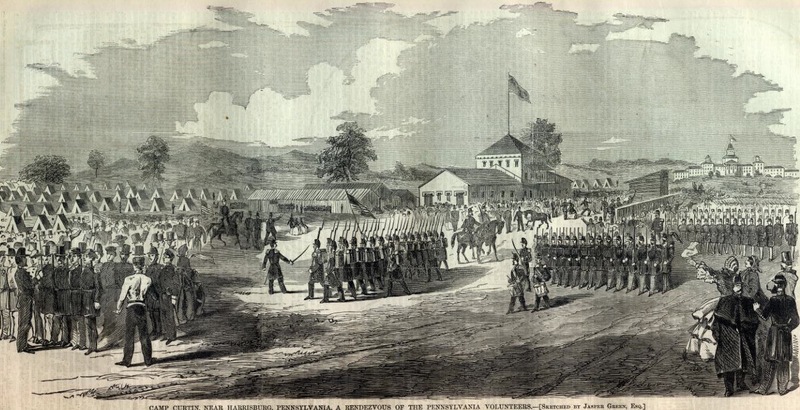 He then mustered as a Sergeant with the 47th Pennsylvania’s Company D on 31 August 1861 at Camp Curtin in Harrisburg, one of the Union Army’s major staging areas. Military records noted that he was a 23-year-old farmer who hailed from Amherst, New Hampshire. Stationed about two miles from the White House at “Camp Kalorama” in the Kalorama Heights section of Georgetown in Washington, D.C. on 21 September 1861, Holt and the 47th Pennsylvania were mustered into federal service with the U.S. Army with great pomp on 24 September. On the 27th, they were assigned to General Isaac Stevens’ 3rd Brigade, becoming part of the larger Army of the Potomac commanded by General W.F. Smith. The early days of their service were frequently rainy ones, resulting in great hardship and increasingly frequent illness. In this climate of torrential rains and lingering dampness, Frank M. Holt became one of the 47th’s first casualties. Contracting Variola (smallpox), he died at the Union Army’s Kalorama General Hospital* in Washington, D.C. on 28 October 1861. * Note: Frank Holt’s regiment had decamped from Kalorama Heights a month earlier (on 27 September) in order to join the Union Army advance into Confederate territory. Still part of Gen. Stevens’ 3rd Brigade, they established a new camp near Fort Ethan Allen, Virginia, and were again plagued by heavy rains. The Georgetown, Washington, D.C. hospital where Frank Holt died operated specifically as an eruptive fever general hospital. Opened 3 May 1861, it was moved in August from its original location to a brick building on Kalorama Heights. was the worst case he ever saw. It was the regular black, confluent small pox…. I had him vaccinated at Harrisburg, but it would not take, and he must have got the disease from some of the old Rebel camps we visited, as their army is full of it. There is only one more case in our regiment, and he is off in the same hospital. … we publish a tribute of respect to the memory of FRANK M. HOLT, by his companions in arms. Never has the death of a comparative stranger called forth more heart felt sorrow in this borough. Young Holt came to this place last Spring, a short time before Capt. Woodruff’s Company was called into the three months’ service. He had been here long enough however, to make many acquaintances, and many sincere friends. Kind, gentlemanly courteous, and honest in all his transactions, he won for himself the esteem of all who knew him. He was from New-Hampshire, and was worthy a representative of the land of steady habits as we ever knew. He connected himself with Capt. W’s Company as a private, and discharged his duty nobly and faithfully. He returned with it at the expiration of the three months, and although at times he spoke of going home to see his kindred, he concluded to defer his return home till after the Rebellion had been put down, and again went with the company. He was appointed Sergeant, and filled the place with marked ability until disease struck him down. He was conveyed from the Camp to the General Hospital near Georgetown, where he died of small pox, Oct. 28. He was about 23 ys. of age. Peace to the ashes of the stranger soldier, and may his mother console herself with the reflection that he died in service of his Country. Although Frank Holt was memorialized at the Meadow View Cemetery in Amherst, Hillsborough County, New Hampshire (the hometown cemetery where his parents and siblings now rest), the monument present at that cemetery in Amherst is actually a cenotaph at the Meadow View Cemetery. 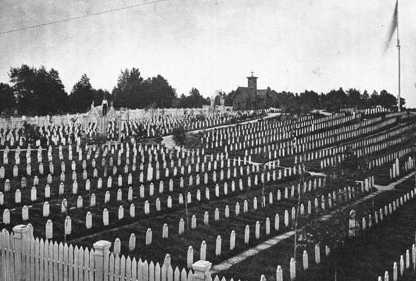 Multiple federal burial records confirm that Sergeant Frank M. Holt was officially laid to rest in grave 3276 at the U.S. Soldiers’ and Airmen’s Home Cemetery in Washington, D.C., and that his remains are actually still located where he was interred soon after succumbing to smallpox in 1861. Sergeant Frank M. Holt rests in good company. At least one other member of his Civil War regiment is interred there, as are 21 Medal of Honor winners. 2. Burial Ledgers, The National Cemetery Administration and U.S. Department of Veterans Affairs (Record Group 15), U.S. Departments of Defense and Army (Office of the Quartermaster General, Record Group 92). Washington, D.C.: U.S. National Archives. 4. Holt eulogy, in New Bloomfield Democrat. New Bloomfield: 1861. 6. U.S. Census (1850: Amherst, New Hampshire; 1860: Amherst, New Hampshire and Monmouth, New Jersey).